Qualifications: Without the relevant qualification you do not know the nitty-gritty of the job. You can’t be a book-keeper without a proper qualification in accounting. Your technical skill is the foundation of a fruitful career. Experience: You can obtain on-the-job training to gain the necessary experience to apply for your first job. Related experience is essential for you to get hired. Multilingual: With English alone you may be able to survive in other English speaking countries but not in a multiracial country like Malaysia. You should be competent, for a Chinese, in Chinese, English and Bahasa Malaysia. Your ability to communicate effectively in three languages will be an added advantage. Trust: Build the trust of your boss in you. Deliver on time as promised. Be reliable so that your boss can count on you. Never say die attitude: Persevere until a problem is solved. You are employed to get things done; do not throw back the problems to your supervisor. Honesty: The gut to tell the truth when you make a mistake and not to blame others. Accept and learn from your errors. People skills: Your ability to get along well with your boss, your co-workers and your subordinates is highly valued. Maintain a cheerful disposition at work and do not allow personal problems to interfere with your work. Loyalty: You do not gossip but keep the company’s secrets to yourself. You look after the interest of the company and suggest ways to improve the image of the company. High self-esteem: You are perceived as a person of confidence. You are able to inspire and motivate other staff. In other words you are a leader. Open-minded: You are adaptive to changes and new ideas and able to accept constructive criticism. You are not expected to possess all these qualities but you must have the basic qualifications and experience and the most important personality traits are trust and honesty. According to Wikipedia a mission statement is a brief statement of the purpose of a company, organization. It is ideally used to guide the actions of the organization. By reading the mission statement you will know the purpose and business of the company and their goals and values. The mission statement identifies my blog as a niche blog about self improvement and it wants to offer tips to improve important areas of everyone's life. The value of this blog? By reading the articles, hopefully, the readers will be motivated, inspired and uplifted. By the way it is also the tag line of my blog. Draft a mission statement for your blog to bring your website to the next level. Make it short, concise, accurate, purposeful and appealing so that it is easily remembered. According to Wikipedia an elevator pitch (or elevator speech) is an overview of an idea for a product, service or project. The name reflects the fact that an elevator pitch can be delivered in the time span of an elevator ride (for example, thirty seconds and 100-150 words). Elevator Pitch is a term made famous by Chris O’Leary in his book, Elevator Pitch Essentials. It is a fantastic communication tool. You use it when you want to talk to someone who is in hurry in a few words to attract the interest of the other person to find out more about your topic. An elevator pitch should be short, precise, accurate and stimulating enough to excite the listener to dig further about what you have to offer. How do you use an elevator pitch to promote your blog? Use as few words as possible to tell the readers about your blog and to attract their interest to find out more about your content. To be effective your elevator pitch should be brief, precise, accurate, appealing and beneficial to the readers so that they will read further. As a husband and a father of two, I am an article writer and a blogger with a niche blog in self improvement. In 23 words, I have disclosed enough information about myself and my blog to allow the reader to explore further. I use it for my profile at social networking and social bookmarking sites. I have a longer version for my personal site’s profile. You can use the elevator pitch as your blog’s tag line and at your profile page. You can also use it at social networking sites and social bookmarking sites. You can even print it on your business cards to spark a conversation between you and the recipient of the card. Think of an elevator pitch to promote yourself and your blog. Get up early: This is the most effective stress prevention measure. You don’t have to rush about to get things done because you have ample time to do what you need to do. Day-to-day advance planning: Every day you get ready with your to-do list and you carry out the task accordingly. You will not miss a thing or else, without a list, you remember it at the last moment and you create tension by rushing to get the job done. In fact, early in the morning is the best time for you to plan the activities of the day with a fresh and clear mind, without being disturbed by others. Imagine this situation: You are about to leave the office and your boss walks in and ask you to do an urgent report requested by HQ. Can you say ‘No” because you have committed yourself to pick up your children and go to KFC for a happy meal together with your spouse after work In fact it is a long overdue promise and you have made up you mind to do it today. When you cannot say ‘No’ you have to work overtime to complete the report. Under such situation, what do you do? Be very angry and curse and swear about it? The thing is that when you have agreed to work overtime and the right frame of mind is just to do the job wholeheartedly because when you are angry about the situations it is going to hurt you even more and nobody else. Work the normal way to complete the task and join your family later. Physical exercise: It is one of the best ways to release your stress and keep your spirits on top of the world. Meditation: It gives you inner peace. It slows you down and you will do things in an orderly fashion. A balanced diet: Unhealthy foods cause stress in your body. Maintain a balanced diet. Enjoy plenty of fruits and vegetables. Sufficient sleep: Recharge and rejuvenate your body and mind with a good night’s sleep. The next day you are full of energy to deal with stress. Keep a pet: A pet such as a dog gives you unconditional love so it is a good stress therapy. Massage: Pamper your body with a relaxing massage. Personal money management: One of the sources of stress in life is financial problems. Live within your means and owe nobody any money and you will be without stress. Deep breathing: When you are under stress you breathe more from the chest and less from the abdomen. This restricts the oxygen intake to your brain. Proper breathing eliminates stress. Creative outlets: What is your interest and passion? Doing things that you enjoy is a delightful way to unwind. Playing a musical instrument is a good example. e exex. You can prevent stress by getting up early and follow your to-do list accordingly. 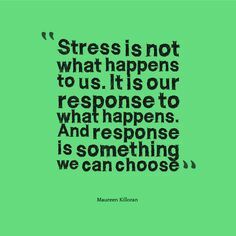 Stress at work is the thing that you have to live with. At work, you reduce stress with a positive mental attitude so that you don’t aggravate the situation and make yourself even more stressful. The last thing is that your stress-releasing lifestyle will be able to deal with stress more effectively. I have found out that the more you tell about yourself the easier it is for you to get followers. According to two articles from Hubspot, Can Having a Twitter Bio Get You 8 Times as Many Followers? and Bio Characteristics of Twitter Power Users, you can get more followers when you include a bio and a homepage link in your Twitter profile. Further to that it is revealed in the second article that your title such as official, founder, speaker, expert, guru and author in that order is able to get more followers. The kind of work that you do will also work in your favor when you are a marketer, entrepreneur, blogger, CEO or a consultant in that order of popularity. The things that you blog about is another deciding factor to get more followers especially when you blog about marketing, news, health and tech in that order of importance. If you are a husband, a father, a wife or a mom in the same order of choice you are also in a favorable position to get followers. A husband and a father of two. An article writer and a blogger with a niche blog (Self Improvement). By the way, there is also another article saying that a username with underscores and numbers will get fewer followers. I have also changed my username from Charles66 to CharlesChuaCK. You can read this interesting article at Picking a Twitter Username? Don't Use Numbers or Underscores. I will keep you posted if I do get more followers then. Financial goals: How much money do you want to accumulate in the next five years? Set a realistic target. At the end of each year you can compute your net worth to check how close you are to your objectives. Savings: The amount you want to save every month is related to your financial goals. You set aside a specific amount before spending your money. Investment: The money that you have saved in the bank to earn interest is not even sufficient to offset the inflation rate. You need to invest wisely to reap a reasonable higher return to beat inflation and sustain growth. Spending: An important rule is to live within you means. Buy what you need and not what you want because your wants have no limit but there is a limit to what you can afford. Debt management: The best thing in life is to buy with cash except for the purchase of a house and a car. Don't ever try to accumulate credit card debts. It will ruin your creditworthiness. Insurance for wealth protection: Having adequate insurance coverage to protect your wealth is part and parcel of financial planning. It is also prudent to have enough medical insurance to cover illnesses, accidents and disability. Will: Draw up a will is a hassle-free way to transfer your wealth to your loved ones when you’re no longer around. Charity: It is a gesture of kindness to help the needy. The amount is not important. What maters is the sincerity from the bottom of your heart to give. Educational fund and retirement fund: Life is going to be miserable with insufficient fund for old age. Set aside an amount for the golden years. Financial independence is an important goal in life. Allocating a sum for children’s education is another major consideration of your financial goal. A good education for the children is one of the best forms of investment. 1. Be an early riser: Getting up early every morning allows you to avoid all the rush to get things done like sending your children to school. You can profitably use the time to organize the day ahead of you so that you go through the day smoothly and calmly. 2. Meditation: This is my morning ritual. When I get up in the morning the first thing I do is to practice a round of Tai Chi. This is a form of meditation in motion. Tai Chi consists of 108 very slow and continuous movements. When you do it and your mind is wondering you tend to do it faster. To reap the benefits concentrate your mind and soul on the movements. At the end of the session I feel calm and relaxed and it set the pace for me for the rest of the day. 3. Eat slowly: Get away from your workstation and go out to take you meals. Sit down to eat and chew and savor each mouthful. When you eat in a hurry you could be overeating. It takes time for the brain to signal you that you are full. 4. Sleep: You don’t sacrifice sleep to do more. You are burning a candle at both ends. Sufficient sleep is essential to recharge your battery and restore your energy. When you get up the next day you are fresh and you can live the day fully and energetically. 5. Take frequent breaks: Have a break when you feel tied. Get up to stretch your body and walk about or enjoy a tea break in the afternoon. You will work better that way. 6. Go back to nature: This is a way to help you slow down. To enjoy nature you have to be patient, Go to the beach, look at the sea and listen to the waves. Visit the county side, look at the greenery and listen to the birds chirping on the trees. Admire the blooming flowers in your garden and study the snail crawling on the ground. These are some of the delightful things that you can do to take it easy. 7. One task at a time: When you have too many things in your mind you are not paying your full attention to the task at hand, you tend to make mistakes. Write down the things you are thinking about that you have to do later and focus on the current job. 8. Look after your health now before it’s too late: Don’t think that you can work continuously with no concern for your health. I have just heard of a hardworking guy who is forced to take rest, perhaps, for the rest of his life because he has suffered from a stroke recently. He thinks that a person should be busy all the time and laziness is a waste of time. 9. End the day well: Before you go to sleep make sure that there is nothing to bother you to enjoy a goodnight’s sleep. You have already taken care of any outstanding issues by putting them in the to-do list for the following day. Instead of watching your favorite TV you go to bed early with peace of mind and you will be an early riser the next day. 10. Quality instead of quantity: Don't rush and create tension just to do more. A hurried life is damaging to your health and well-being. Learn from nature and appreciate yourself. The sun rises and the sun sets. There is a time for everything in life and when you are doing it, be mindful about it, appreciate it, enjoy it and be happy. Write to the point: You deliver your content to match your article title so that readers are not disappointed and turned off. You write nothing less and nothing more but just to focus on the subject. Write cohesively: Make sure that the article is a good flow from the beginning to the end. It is well connected from one paragraph to another. There is a good opening and an action-oriented ending. Write naturally: Write the way you talk to someone sitting in front of you. It's friendly and likeable. Write about yourself: Readers are more interested to know what you have to say about the subject that you are blogging about than your writing. As far as possible include your own experience into your article. Write for the readers: Don't write for the search engines. In fact when you write for the readers by using the appropriate words, it is even easier for the search engines to pick up your article simply because readers are using the same keywords that you have used in your article to search the Web. Write short, simple words and short paragraphs: Write to express and not to impress the readers. It is all about communication and connection with the readers. Write concisely: Write long enough to convey the message but not too short that the essence of the article is not there. Readers have too many articles to read in too short a time. If you want the readers to read your article your have to get rid of verbiage. 1. Job satisfaction: When you are satisfied with your job performance it boosts your self-confidence and self-esteem. You should improve the quality of your work to bring your self-esteem to a higher level. 2. Physical exercise: You should be proud of yourself especially when you are physically active. Just look around how many among your neighborhood are regular jogger or physically active. Keeping yourself physically fit will strengthen your health and well-being and indirectly it enhances your self-esteem. When I heard of people younger than me suffering from stroke , high blood pressure or diabetes I feel proud of myself being healthy. 3. Focus on your achievements: Always think of your success. For example, as a blogger I am delighted that the more I write and post my articles to my blog the better is my Traffic Rank. I am totally thrilled and excited. Naturally my self-esteem is elevated. Just remember to compete with yourself and not with others because there is always someone better than you. 4. Personal appearance: The way you dress tells a lot about your self-esteem. Dressing smartly helps boost your image and self-confidence and also your self esteem. Always dress appropriately. 5. Develop your strengths: It is easier to develop your strengths than to improve your shortcomings. Your strengths are the things that you enjoy doing and you can do better than others. When you make further improvement it raises your self- esteem to the next level. 7. Financial security: The ability to manage your personal finance well means you can live independently; it will definitely impact your self-respect and self-esteem positively. When you feel good about yourself it makes you happy. 1. Goals: You set goals to set your direction in life. Your major goals will dictate your daily activities. It is good to highlight here that you should set SMART goals: Specific, Measurable, Achievable, Relevant and Time-sensitive. Your goals should be well-balanced to include your health, your financial situation, work, family, relationships, lifelong learning and happiness. Establish goals that give you meaning in life. 2. Posters: One of the things that helps reach your goals is to display images of the things that you want in life such as your dream home and your dream car. Every day when you look at it you are constantly reminded of your goals and the images motivate you to work harder to reach your objectives. 4. To-do list: Your daily to-do list is closely linked to your long-ranch goals. It is a wonderful tool. First of all it is a reminder for the things you need to do for the day. It also gives you a sense of achievement as you cross out the things that you have done. Depending on which one that works better for you, you may like to maintain two lists, one for work and the other one for personal items. 5. Reading and learning: Keeping yourself up-to-date is the only way to improve yourself in life. Make it a point to read every day such as books, newspapers, magazines, and you also surf the Net to look for more information. The more you learn and the more you know the easier it is for you to utilize the knowledge to realize your aims. 6. Annual net worth review; How do you know you are getting richer as time goes by? The only way to find out is to draw up an annual net worth sheet. It is actually the difference of what you own (your house, your car, your bank accounts, investment, cash value of your insurance policies and other assets) less what you owe (car loan, housing loan, outstanding bills including credit card debts). If the bottom line keeps getting larger it means you are getting wealthier. Net worth is your tool to measure how successful you are against your financial goals. 7. Physical exercise: Keeping yourself in good health is an important part of your on-going goals. You maintain good health and well-being by regular exercise. Be sure to do an annual check-up to confirm the status of your health. 8. New places: Visiting unfamiliar places is one the best way to broaden you outlook in life. Learn the way of life from other races and get to know more about their cultures. 9. New faces: You gain some insight by meeting and talking to more people. By listening to them you learn one or two new things to improve yourself. 10. Meditation: It gives you inner peace and promotes your spiritual health. You are more relaxed, calm and happy and are not easily affected by negative events. You can concentrate better and are more creative. These tips create self-awareness and monitor your progress. You will know how successful you are in the most important areas of your life especially your health, financial matters and happiness. • Watercress, rocket leaves or rucola, radish, horseradish and wasabi. • Turmeric, capers and pomegranate. However, he recommends the premium herb - milk thistle. According to Wikipedia milk thistle has been reported to have protective effects on the liver and to greatly improve its function. It is typically used to treat liver cirrhosis, chronic hepatitis (liver inflammation) and toxin-induced liver damage. Milk thistle is widely available at health food stores. Uniformity: It means the same system of appraisal is used for the same category of staff. Be honest: Identify a worker's strengths as well as his weaknesses in relation to his performance He needs to know what he is doing right as well as doing wrong. Training and development: When a worker does not measure up to expectation he should be provided with further couching to make him a competent worker. The care and concern of the management will be appreciated by the employee and he is motivated to strive and do a better job. Likewise an employee who meets or exceeded expectation should be groomed to move up the ladder. Be Objective: Focus on the measurement of the employee's achievements in a particular job and not his or her personality traits. The aim of the appraisal: Make it very clear to the employees about the objective of the appraisal in order to get the full recognition and participation of the staff. Two-way communication: An Employee is strongly encouraged to highlight his or her work during the appraisal session. The supervisor and the employee should discuss expected and actual performance with reasons and ways to improve upon things such as attitudes, knowledge and skills. Fairness: The appraisal system should be carried out fairly among all staff so that it is accepted by them. There should be a clear procedure for the employee who feels that the review was handled unfairly to appeal to the next level of management. “When measuring performance you must remember that you're not trying to measure the “person” of the individual; you‘re trying to measure the "contribution “of the individual,” says F. E. Reese. I have recently subscribed to Google Reader. Google Reader is a Web-based aggregator, capable of reading Atom and RSS feeds online or offline. It is a great tool for gathering, reading, and sharing all the interesting blogs and websites. To me it is a wonderful learning tool. This is what I have done recently. I entered the keyword ‘self improvement" at the ‘Add a subscription’ button and a list of sites relating to the keywords appeared. I then chose the ones with the most subscribers and subscribed to them. This was all I did. Now on a daily basis I can read and learn from other blogs about articles on self improvement. The other beautiful thing is that you can check how many readers have subscribed to your feed just by keying in your blog title. You can choose a topic or many topics or the actual sites that you want to subscribe their feeds so that you can read the posts as and when there is an update. You can also share your favorite sites with your friends. I started blogging in October 2007 without knowing anything about the Internet. At that time I was only thinking about writing articles and earn some money from AdSense. As a blogger I have managed to learn things the hard way all by myself. 1. Interest and passion; I find that the more I blog the more I enjoy doing it and because of my interest learning is fun to me. 2. The thirst for and the urge to learn new knowledge: When I started blogging I was curious to find out all about blogging from Blogger to AdSense , from SEO to Traffic Rank and PageRank and from Twitter to Facebook and many many more things. My quest for new ideas continues unabated. 3. Make it a daily habit: The surest way to sustain a learning attitude is to keep writing and posting articles. It will soon develop into a good habit. As I write I do research and learn from successful writers and bloggers. 4. Happiness in blogging: The other thing that motivates my keen interest in learning is that from time to time I receive good comments about my articles. It makes me happy and spurs me to learn more about writing quality articles. 5. Perseverance: Learning is a lifelong process. To get ahead we have to keep abreast of the latest development in the blogosphere. This is how I started and here I am today. I am happy to say that more and more readers are coming to my site to read my articles and I will continue to write more and more stimulating articles for my readers. 1. Identifying yourself: What do you want yourself to be perceived as? Identify your strengths. Find out your interest and passion. Check out the things that you can do better than others with ease and also the things that mean a lot to you and to others. As an example I am interested in writing articles and I can write an article a day. I want to be known as an article writer and a blogger with a niche blog (Self Improvement). First thing first, find out what do you want yourself to be known as? 2. Your track record: The next stage to promote yourself is to build up your credentials. Again I am using myself as an example. As an article writer I have written more than 500 articles over a period of 17 months. I have also posted an article a day to my blog at the same time on a subject relating to my niche – self improvement. This is how you establish your track record. 3. Networking online and offline: Networking means you have a group of like-minded people in your circle of influence. When the need arises you can seek help within the group. • Offline: Get to know more people by expanding your circle of contacts, especially those in the same industry. Get to know the latest happenings and keep yourself up-to-date. • Online: Update your profile at Linkedin, Facebook and Twitter. These are powerful networking places. Make friends with people sharing similar interests. When you have established your personal brand and you have also built up your track record and get yourself noticed by others, you will, very likely, attract the attention of headhunters. The opportunities ahead of you will be without limit. According to Charles Buxton,” You will never find time for anything. If you want time you must make it.” You don’t manage time. The time is always there, you are given 24 hours every day. The best thing in life is to fill the time with meaningful activities which mean a lot to you. Work: Are you able to do more in less time. Are you able to improve your productivity in the office? Have you discharged your duties and responsibilities to the best of your ability? Is your boss happy with your performance? What do you want your co-workers to say about you when you are not in the office? Family: How often do you spend quality time with your family? You have promised your children for a Sunday outing to the beach and the children are still waiting for the day. You have suggested to your spouse to spend an evening with just two of you but your have not found the time to do it. Sleep: You cannot cut short you sleep just to do more. It does not work well this way. Having sufficient sleep will allow you to have your waking hours with peak energy and freshness of your mind to live a full day more efficiently and effectively. Exercise: This is the activity that you must do. Your health and well-being will make the other activities to work well. Have you devoted some time every day to be physically active? Interest and passion: One of the most important things in life is to fill the time with the things that you enjoy doing and you can do it better than other people and it also means a lot to you. As an example I enjoy blogging and I can post an article a day. I am happy that my articles are able to inspire, motivate and cheer up the mood of my readers. To be able to impact the life of others means a lot to me. New Year‘s resolutions: You have decided to read one inspiring book every month and you have purchased the first book but you have not started reading it yet. You have intended to quit smoking but somehow it is not working out. You have…Start today and make it a habit so that whatever you have decided to do will transform your life for the better. Happiness: Is your happiness depends on something to happen in the future? Do not wait, make up you mind to be happy now. Appreciate and value every day of your life and be happy as what you are and enjoy every moment of your life. Life is too unpredictable to depend on something to happen in the future in order to be happy. Amino acid proteins are the building block needed for healthy firm skin. The most important ones are collagen, elastin, keratin and hyaluronic acid. It makes up about 25 percent of the total amount of proteins in the body. Collagen gives body tissues form and provides firmness and strength. It is another protein found in the skin and tissues of the body. It keeps skin flexible but tight. Enough elastin in the skin means the skin will return to its normal shape after a pull. It is another major protein in our skin. It promotes elasticity in your skin and helps hold your skin firmly together and prevent sagging. The loss of keratin is one of the major factors in skin aging and sagging. Hyaluronic acid occurs in abundant amounts in many of the places such as the skin. It is needed to cushion and lubricate joints, eyes, and skin and heart valves. It gives the skin its volume and fullness. Purchase of books: A relief of up to RM1, 000/= is given every year for the purchase of books. You can buy any books: education textbooks, fiction and non-fiction books and magazines. However, newspapers are excluded. This is the way of the government to stimulate the reading habit among the subjects. Keep the receipts of your purchases in order to make claim .You may also buy books as gifts to promote reading habits in others. Purchase of a personal computer: Every three years you are allowed a tax relief of RM 3,000 for the purchase of a personal computer. This incentive has far reaching impact among the people. With a computer you posses an essential tool. You can surf the net and you are exposed to more information in the World Wide Web. Post graduate education: The government is also granting a tax relief of up to RM5, 000 per year when you take up post graduate study in law, accountancy, Islamic finance, technical, vocational and industrial training, science or information technology. Again, with this incentive the government wishes to build up a pool of experts in the various fields. Knowledge is power. A country with many experts is a powerful country and Malaysia is going in that direction. • Articles about stories and facts: This is best to present a story from one event to another and facts from one fact to another in paragraphs. • Articles about tips and benefits: The most effective way to present this kind of articles is to put them in bullet points so that the reader can read and digest the article easily and quickly. • Spacing: Having a page full of writing with paragraphs close to one another will surely turn your readers off. Provide ample spacing from one point to another and from one heading to another. • Images: Whenever possible an image should be included in an article. It will definitely spice up your article and the readers are stimulated to read your article. As an example my article, Baby Boomers – The 7 Ingredients of Happiness, there is an image of an elderly couple walking hand in hand along a deserted beach. The image is so romantic and it serves very well to complement my article because the picture vibrates a feeling of happiness and contentment. The readers will be fascinated to read the article. In fact there is a website, Myera, linking to this particular article. There is another article of mine, Girls – 10 Safety Tips to Look After Yourselves, with an image of a frightened girl which is featured on Google Video . Just fancy that. Present your article content in such a way that the readers are captivated to read.